These incredible words came from Linda Feagler, the Senior Editor at Ohio Magazine. Linda was in my adopted hometown of Maumee yesterday, meeting with business owners, seeing historic sites, and generally rediscovering why our city is so special. I was asked to meet with her to share our Claire’s Day story, and the amazing growth of the organization and event. I was joined by Jeanette Hrovatich, our Executive Director, and John Jezak, the Administrator and Safety Director for Maumee. When Linda made this statement regarding our C.A.R.E. Awards, our special reading awards given to children chosen as the most improved readers in their schools, we all just looked at her, stunned by the strength of her statement. “Life event. I like that,” Jeanette said. I do too. So much so, that of course, I had to write about it. No matter how much time has passed, it is still a little hard to tell the story. But every time I do, I get a little nugget of admiration, of inspiration, of gratitude that carries me through the tough parts. Sometimes I lose sight of the impact we’ve had on children’s lives through Claire’s Day and our Claire’s Awards for Reading Excellence program. At times it is even difficult for me to comprehend the significance of what we’ve accomplished; Brad, Kyle, Ian and our hundreds of volunteers, and now staff. I tend to downplay our magical remembrance, honestly humbled by what we’ve created in Claire’s honor. And then, with words like Linda’s, it smacks me upside the head and strikes right to my heart. What we’ve done has had such an impact on the lives of thousands of children. We have created a once-in-a-lifetime experience for our C.A.R.E. Award winners. To think that they get to choose their very own book at the festival, and then to have it personally signed by one of our authors and illustrators. That’s just pretty darn special. And now, having been that author on the other side of the table, as that child looks at me with huge eyes filled with joy, excitement, and sometimes a bit of shyness, well, that’s a life event for me. These words stuck with me throughout our recent incredible trip to The Last Frontier, Alaska. They came from a 75-year-old adventurer, Sally, to her 85-year-old friend, as she struggled to get her camera working properly while we were up on a glacier near Denali. 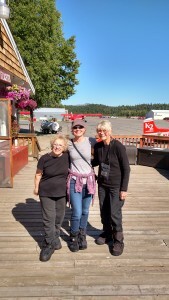 Yep, Betty and Sally flew up with us on a de Havilland Otter, a turboprop plane operated out of Talkeetna by K2 Aviation. As eight of us loaded into the plane, Brad and another taller gentleman were instructed that they could sit anywhere but the back. My assumption was that even though the aircraft is the quintessential bush plane, and has incredible STOL (Short takeoff and landing. Good in case moose happen to be on the runway. Seriously. It happens there), a heavy tail doesn’t help. As I strapped on my seat belt, I got a little nervous seeing that the plane was manufactured in my birth year. Granted their turbo props had been upgraded, but I was still a bit anxious, knowing at this age sometimes my body doesn’t want to fully cooperate. I said a silent prayer, hoping that today this plane’s systems were all in working order for our flight. As I was untangling the cable to my headphones, I heard my daughter Kyle’s voice behind me. “You just press the headphones in at the top to make them fit,” she said. I turned around to see that she was helping Betty and Sally. It both warmed my heart to see Kyle assisting them, and to see their gratitude in their eyes. Take-off was quick and easy. It was a beautiful, sunny day, so we didn’t experience any turbulence from heavy, low-lying clouds. We flew up from the base at Talkeetna, the launching pad for many of Denali’s climbers. We were flying a popular route, both for drop-off of hikers at base camp, as well as for those of us ultimately landing on a glacier. I’m grateful I didn’t discover this information from an FAA Denali flight information guide until just now: This can be a very high volume route during May and June. Aircraft are leaving Talkeetna and flying the most direct route to “base camp” on the Kahiltna Glacier. Watch for “One Shot Gap”: minimum altitudes 8500 ft MSL, listen, stay right, watch diligently for opposite direction traffic, listen for reports of downdrafts and turbulence. Don’t get caught with no way out. I’m sure Betty and Sally were glad not to read this before our trip as well. Kyle might have been helping them with more than their headphones. The Denali peak, at 20, 320 feet, was clearly visible throughout our flight. It is majestic, snow covered, incredible and almost beyond words. As we flew around the mountain, it gave me an even greater appreciation for those who scale the monster. Over 100 climbers had reached the summit the week we were visiting. We flew through a section called the “747 Pass.” The name was reassuring, because from my perspective, it seemed as though it was just wide enough for our small plane to fly through. The pilot brought us down a few thousand feet before landing on Ruth Glacier, in an area known as the Mountain House. Yep, there is a small cabin, built by a famous pioneer aviator, Donald Sheldon in 1966. We could see the house on the rock outcropping, with the outhouse nearby, seemingly on the edge. Wouldn’t want to take a wrong turn on that early morning trip. We unloaded from the plane, one at a time, carefully on to the softened snow below. We all stumbled over the tracks from other plane landings, our sun-protected eyes still blinded by the glaring sun and bright blue sky. Kyle and our son Ian threw snowballs at each other, Brad and I hugged, simply in awe. And Betty and Sally tried to take pictures with their camera. I felt sorry for them, knowing that for all of us, this was a once-in-a-lifetime thing. That’s when Sally offered her sage advice. We should take in everything with our eyes and keep it embedded in our hearts. Our time on the glacier was up entirely too soon. Our pilot ushered us back into the plane. Betty was having a bit of a challenge walking across the snow back to the plane, so I offered her an arm. Then, with an apology for getting a bit too personal, I pushed on her backside to help her up into the plane. She giggled at my comment. Or maybe at my goose, I’m not sure which. Before we took off, Brad gave Sally one of his business cards, suggesting she email him, and he would be happy to send her pictures he had taken up on the glacier. Her eyes glistened as she accepted his card and offer. We landed safely, and the adorable ladies, gushing with their gratitude, were kind enough to grant my request of taking a picture with them before we went our separate ways. This Alaskan trip was symbolically our last frontier, as it was our 50th State to visit with our children. It was the completion of a mission we began in earnest after losing our daughter, Claire, in 2000. I know I will hold on to all the big and small memories of all our journeys forever in my heart. And just maybe I’ll share them all with you some day. Check out this interview on The Winged Pen blog! Check out a recent interview with Tom Hodson of WOUB Public Media, Athens, Ohio. I’m killing two birds with one stone on this Journal post. Check out the Song of Six Pens blog I was asked to post as a guest. Enjoy! My first recollections of a library were of that glorious smell of old books from the branch at the school in my hometown. I long for that aroma of vanilla and mustiness all rolled into one. I remember curling up on a metal staircase in the library, finding a perch by a window and taking in my primers. I learned to ride a bike at an early age, the incentive being the bookmobile that magically arrived a mile up the road from our home in the country. I’d hop on my little banana seat bike, basket laden with the previous week’s selection of Nancy Drew Mystery Stories, past the pump house that provided the water to irrigate the surrounding corn fields, and onto the road that dead-ended into what was my grandparents’ farm. There I’d find the library on wheels, waiting patiently for me. I’d stand up my tippy-toes, reaching high up on to the shelves for a new Bobbsey Twins adventure, or to see if Are You There God? It’s Me Margaret, or Charlie and the Chocolate Factory were available to read. Again. My high school library fed my fascination with all things Edgar Allan Poe and helped me embrace Shakespeare. On to college, and the quiet spaces got me through exams and research papers. Then my love affair took a break, as I entered the workplace. Not much time to read, as I made my mark in sales and management. I got married and had three children faster than you could turn a page. And the library took a whole new role in my life. In its collections and story time programs at first, and then, in a way I never would have imagined. When our ten-year old daughter died suddenly and unexpectedly, the library provided sanctuary. First within the endless bereavement books I read, trying to find answers where there were none, and then as the site of the children’s book festival we established in Claire’s name. These days I’ve been blessed to be in sections of libraries that many people never have reason to visit. Places that require special permission to enter and have names like Archives and Manuscripts Division and Rare Books Room. These places, with their old book smell, take me back to that metal staircase, getting lost in letters and hoping to learn to string them together to form a word, a sentence. And they take me forward to places that allow me to create story. For libraries have seen me grow from that little girl learning to read, to a woman honoring her daughter gone too soon, to the writer creating books now found on their shelves. So thank you dear libraries, and all the incredible librarians and staff who have fed my passion, supported my mission, and helped with my writer’s journey. I think we should celebrate you EVERY week.